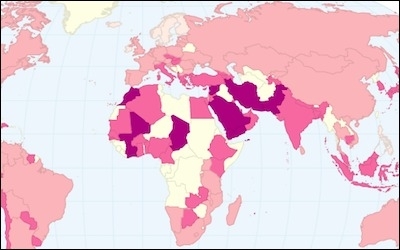 In this map from the 2012 Global Gender Gap Index, where the darker the red the lower the status of women, the only signs of light in the Islamic World are those countries left white for lack of data. The United Nations panels lovingly practice hypocrisy all the time. In 2016, a UN debate revolved around the Commission on the Status of Women (CSW), which voted to blame Israel for Palestinian domestic violence. This year's show was hardly different in the content of nonsense. 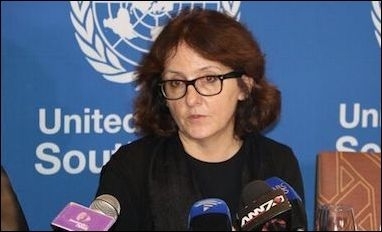 The executive director of UN Watch, Hillel Neuer, asked Dubravka Simonovic, UN Special Rapporteur on Violence against Women, at a session on June 12: "Ms. Simonovic, in other words, what you are saying is as follows: 'When Palestinian men beat their wives, it's Israel's fault.'" At first glance it sounds like dark humor, but it is not. Not just one but two reports presented before the UNHRC by Simonovic argue that Israel is to blame for Palestinian violence against women, through "a clear linkage between the prolonged occupation and violence." Where, Neuer asked Simonovic, is the data? There is data, but not the kind that Simonovic would prefer to believe exists. According to the Global Gender Gap Index of the World Economic Forum, there is not a single overwhelmingly Muslim nation in the best 50 scoring list of countries. In contrast, the last (worst) rankings of the index, from 128th to 144th, are with one exception overwhelmingly Muslim countries, including Turkey at the 130th place. Turkey's case is important to note, as the increasing supremacy of Islamist politics in daily life in the country has boosted patriarchal behavior and worsened gender equality since 2002, when President (then Prime Minister) Recep Tayyip Erdogan came to power. In other words Turkey, the 17th biggest economy in the world, is the 15th worst country in terms of gender equality. Women and girls are still exposed to violence, being abused, trafficked, their access to education and political participation is refused and face with many other human rights violations ... The fact of violence against women as a concept emerged through gender inequality is widespread in Turkey. A 2013 Hurriyet Daily News survey found that 34% of Turkish men think violence against women is "occasionally necessary," while 28% say violence can be used to discipline women; a combined 62% approval of violence against women. In 2014, Turkey's Family and Social Policies Ministry reported that its domestic violence hotline received over 100,000 calls, and estimated that the number of unreported cases is three to five times that number. 70% of Turkish women report having suffered physical violence by their partners or family. According to a 2016 study by the same ministry, 70% of Turkish women report having suffered physical violence by their partners or family. Violence against women is a cultural practice, and culture here is a blend of derivatives including religion and politics. Frenchmen, for instance, did not develop a habit of beating their wives during the German occupation. Nor did the Cypriot men after Turkey invaded the northern third of their island. Violence finds particularly fertile ground in societies where the dominant "culture" is derived from Islamist conservatism. At the beginning of the holy Muslim month of Ramadan, for instance, a Turkish professor of theology, Cevat Aksit, said during a television show that: "Women who are not fasting due to menstruation and eat on the street during Ramadan can get beaten." Dubravka Simonovic, UN Special Rapporteur on Violence against Women, says Israel is responsible for domestic violence suffered by Palestinian women. How does Erdogan's government respond to that? Not by law enforcement but by gender-based segregation. Bursa, one of Turkey's biggest cities, recently launched a project to designate separate railway carriages for women on intra-city trains, to make women "comfortable" during their rides. All that is normal in a country where the most popular political figure, Erdogan, is a man who once said that "women should know their place," and that "gender equality is against human nature," and his deputy prime minister once told women not to laugh in public. So, tell us, Ms. Simonovic: Do Turkish men beat and sometimes kill their wives because of Israeli occupation? Is there "a clear link" between Turkey's rising numbers indicating violence against women and "Israel's prolonged occupation?"